Purpose Deep vein thrombosis (DVT) is generally thought to occur rarely in patients who undergo knee arthroscopy, and current practice is not to administer perioperative thromboprophylaxis. In support of this practice, postoperative screening for DVT after 2 weeks from knee arthroscopy was done in this study using ultrasonography technique to detect the DVT incidence after such procedure. Patients and methods This study population consisted of 50 patients, 44 males and six females, who underwent knee arthroscopy and fulfilled the following inclusion criteria: patients aged from 18 to 60 years, those with isolated meniscal injury, and those not known to be at high risk for DVT. Radiographs and MRI were done for all patients preoperatively to diagnose knee injury. The medial meniscus was injured in 39 patients and the lateral meniscus in 11 patients; all were managed arthroscopically. Full DVT screening with lower limbs venous ultrasonography was done for all patients within 2 weeks postoperatively. Results The mean patients’ age at the time of the operation was 27.8 years (range: 18–43 years). The right knee was affected in 22 patients and the left in 28 patients. The tourniquet was used in 43 patients. The mean time for hospital stay was 1.24 days (range: 1–3 days). Only one patient of the 50 developed asymptomatic silent DVT within the first 2 postoperative weeks. Conclusion The incidence of DVT after arthroscopic knee surgery of 50 patients in this study was 2%, which is not a strong prerequisite for perioperative thromboprophylaxis in patients not known to be at high risk. Deep venous thrombosis (DVT) is a manifestation of venous thromboembolism (VTE). DVT is one of the most prevalent medical problems today, with an annual incidence of 80 cases per 100 000. Each year in the USA, more than 200 000 people develop venous thrombosis; of those, 50 000 cases are complicated by pulmonary embolism (PE) . 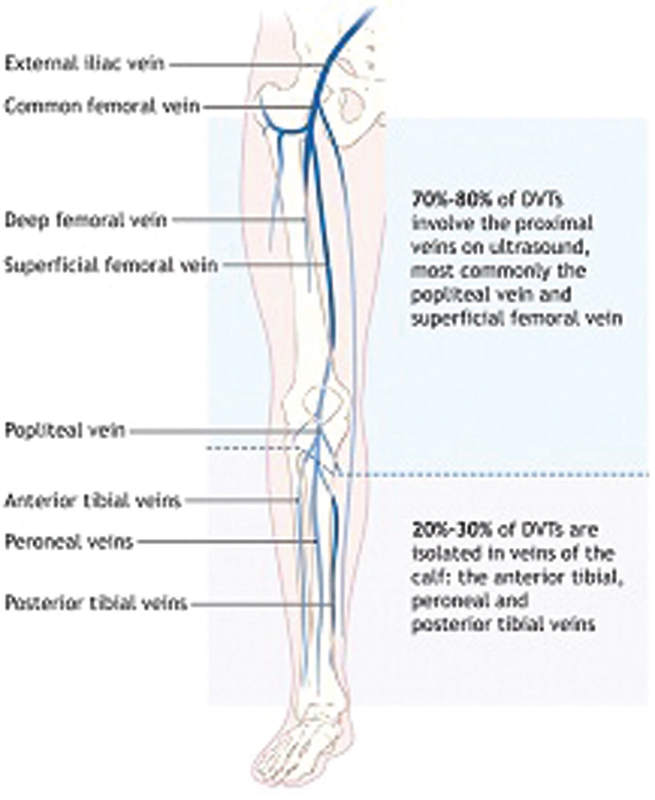 Lower extremity DVT is the most common venous thrombosis, with a prevalence of one case per 1000 population. In addition, it is the underlying source of 90% of acute PEs, which cause 25 000 deaths per year in the USA . VTE is a common and clinically important complication of major orthopedic surgery . For example, patients who undergo hip or knee arthroplasty and do not receive thromboprophylaxis have an overall rate of DVT of 40–70% . Despite the frequency of knee arthroscopy, there are little data on the incidence of DVT in patients undergoing this procedure. DVT is generally thought to occur rarely in patients who undergo this procedure, and current practice is not to administer perioperative thromboprophylaxis . In support of this practice, a recent retrospective survey of American orthopedic surgeons suggested a low incidence of DVT (0.12% of 375 069 patients undergoing arthroscopy) . However, this incidence is an underestimate because patients were not systematically screened with accurate objective tests for DVT, and such a survey, which depends on physicians’ recall, is highly susceptible to bias. Other studies have also reported low rates of DVT (0–7.0%) after knee arthroscopy, but in all these studies, the diagnosis of DVT was made on clinical grounds, which is unreliable . In this series, we had studied the incidence of DVT after arthroscopic knee surgery in 50 patients, within 2 weeks postoperatively. A total of 50 patients underwent knee arthroscopy at Cairo University Hospital, from January 2013 to December 2013, who fulfilled the inclusion criteria. Inclusion criteria were as follows: patients with age ranging from 18 to 60 years, those who had isolated meniscal injury, and those who underwent surgery with or without the use of tourniquet. Exclusion criteria were as follows: torn anterior cruciate ligament, past history of DVT, pregnant patients, patients on oral contraceptives, those with BMI greater than 30, and patients on steroid treatment. The study was approved by the local ethical committee in Faculty of Medicine, Cairo University and all patients were consented. The patients were examined clinically, with special tests carried out to examine the knee. Radiographs and MRI were done for every patient preoperatively to diagnose knee injury. All patients received spinal anesthesia except four patients who received general anesthesia. All patients were positioned supine. Limb was exsanguinated and then a cotton-padded upper-thigh pneumatic tourniquet was applied in 43 patients. The affected leg was hanging off the operation table at the level of the knee joint. All patients underwent classic arthroscopic knee procedure for diagnosis, i.e. partial menisectomy with trimming and shaving. The skin was sutured and crepe bandage was applied. The patients were advised to mobilize their knees same day of surgery and to start immediate isometric quadriceps exercises as well as straight leg raising exercises. Immediate postoperative icing to reduce pain and decrease the incidence of hemarthrosis was also advised. Antibiotics and analgesics were given, but no prophylaxis anticoagulants were used. Routine examination of the knee was done for every patient during follow-up. The stitches and bandage were removed 2 weeks after surgery. Although compression ultrasonography is a simplified technique used for quick diagnosis of DVT, with limitation to common femoral vein and popliteal vein only, it has both high sensitivity and specificity for detecting proximal DVT only in symptomatic patients. Compression ultrasonography is now the imaging test of choice to diagnose DVT. Lack of compressibility of a venous segment is the diagnostic criterion used, but the addition of Doppler (including color flow) can be useful to accurately identify vessels and to confirm the compressibility of a particular segment . As this study’s material depends on asymptomatic patients with no clinically diagnosed DVT, the full examination with lower limbs venous ultrasonography was chosen instead. The common femoral, superficial femoral, profunda femoral, saphenofemoral junction, and greater saphenous veins were examined in the supine position. The examination begins at the level of the common femoral vein at the inguinal ligament. Compression was performed while the transducer was applied in a transverse line in relation to the examined vein, as the vein may roll away when it is in line with the transducer, creating a false-negative result. The Doppler gate was placed in the center of the vessel. Every vein of the lower limb was examined throughout its whole length in both the transverse and longitudinal views. The veins were examined for compressibility with light transducer pressure in the transverse view. The common femoral vein was followed distally from the saphenofemoral junction. 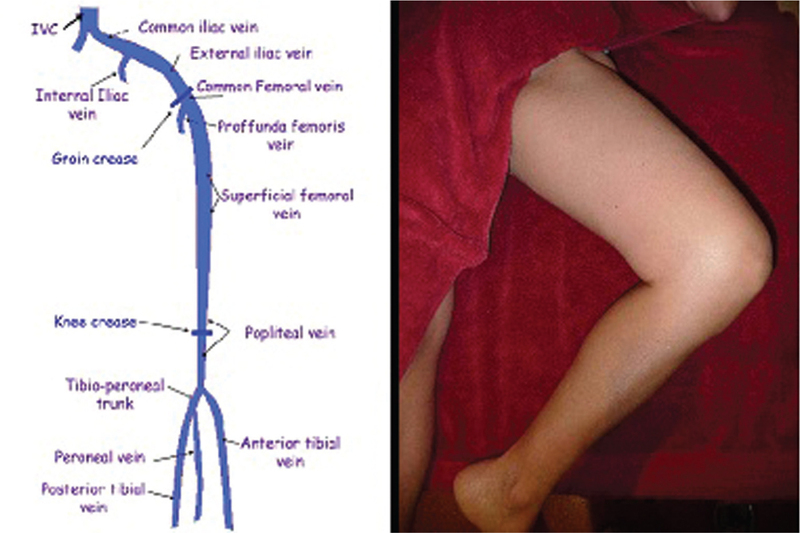 The common femoral vein then divides into the profunda femoral (deep femoral) and the superficial femoral vein ([Figure 1]). Only the first 1–2 cm of the profunda veins was examined owing to its depth. The superficial femoral vein was followed distally to just above the patella where it enters the adductor canal. Figure 1 The ultrasonography testing for the lower limb venous system . The popliteal vein was examined in the supine or dependent position. The transducer was placed behind the knee in the popliteal fossa. The popliteal vein is superficial to the popliteal artery. The gastrocnemius vessels were examined from the popliteal fossa to their end point within the calf muscles. The peroneal veins were examined from the lateral aspect of the calf. The transducer was placed over the popliteal vein and moved distally on the lateral aspect of the calf. Distal to the tibial trunk, the transducer was placed between the fibula and tibia; the peroneal vessels were examined distal to the lateral malleolus. The mean age of the patients at the time of the operation was 27.8 years (range: 18–43 years). There were 44 males and six females. The right knee was affected in 22 patients and the left knee in 28 patients. The medial meniscus was injured in 39 patients and the lateral meniscus in 11 patients. Each knee operated on sustained an isolated meniscal injury. The tourniquet was used in 43 patients. The mean time for hospital stay was 1.24 days (range: 1–3 days). Only one of 50 patients developed asymptomatic silent DVT within the first 2 postoperative weeks. The cumulative incidence rate of DVT at 14 days after knee arthroscopy was 2%. This patient was a 42-year-old female, who had a torn posterior horn medial meniscus and underwent lower limb surgery for her first time. Her BMI was 28.3, and the tourniquet time was 80 min. She had spinal anesthesia and stayed in the hospital for 3 days for nonmedical reason (logistics). She sustained proximal DVT in her right lower limb, the side of knee arthroscopy ([Figure 2]). Figure 2 Incidence of the deep vein thrombosis-affected veins . Arthroscopy procedures are considered minimally invasive. They are the most commonly performed orthopedic procedures in the USA and are usually considered to be low-risk procedures . Therefore, knee arthroscopy was the surgical procedure of choice in this series to study the postoperative incidence of DVT. However, most studies did not indicate whether arthroscopy was performed for diagnostic or therapeutic purposes. Currently, more than 95% of knee arthroscopies involve a therapeutic procedure, which takes longer, involves more local trauma, and probably increases the risk of DVT. Therefore, as more ‘therapeutic’ arthroscopies are performed, the rates of DVT may be increasing . In this series, the knee arthroscopy was used for both diagnostic and therapeutic purposes for meniscal lesions only. The mean age of patients at the time of the operation in this series was 27.8 years (range: 18–43 years). Although a 30-fold increase in incidence is noted from age 30 to 80 years, the effect appears to be multifactorial, with more thrombogenic risk factors occurring in the elderly than in those younger than 40 years . The presence of risk factors plays a prominent role in the assessing the pretest probability of DVT. The most common risk factors are obesity, previous VTE, malignancy, surgery, and immobility. Hospitalized and nursing home patients often have several risk factors . The single most powerful risk marker remains a prior history of DVT . In this series, we excluded the patients with risk factors. The incidence of DVT was studied within 2 weeks after arthroscopy in this series to detect the thrombi, which developed intraoperatively or early postoperatively. As based on radioactive-labeled fibrinogen, approximately half of lower extremity thrombi develop intraoperatively . Perioperative immobilization, coagulation abnormalities, and venous injury all contribute to the development of surgical venous thrombosis. Although most DVT is occult and resolves spontaneously without complication, death from DVT-associated massive PE can occur . Over the past 25 years, the pathophysiology of DVT has been understood much better, and considerable progress has been made in its diagnosis and treatment . In this series, the compression ultrasonography had been used, as recently, the accuracy of this technique has been improved: the examination has been made more comprehensive in terms of venous anatomy, and the procedure has been standardized in terms of patient position, probe position, and ultrasound modalities. The incidence of DVT after arthroscopic knee surgery recorded in the previous studies was either as low as 0.2% , or as high as 19% , and this controversy is because of the different ways of diagnosing DVT between the studies. So, the low incidence is a result of symptomatic or clinically diagnosed DVT, whereas the high incidence is because of screening of all the study population − asymptomatic DVT − with no clinical evidence. Early recognition and appropriate treatment of DVT and its complications can save many lives. The goals of pharmacotherapy for DVT are to reduce morbidity, prevent post-thrombotic syndrome, and prevent PE. The primary agents include anticoagulants and thrombolytics ,. DVT in the lower extremity is a life-threatening complication in the orthopedic practice. Although knee arthroscopy surgeries can be considered an outpatient surgery, the risk of postoperative DVT is unclear. The incidence of DVT after arthroscopic knee surgery of 50 patients in this study was 2%, which is not a strong prerequisite for perioperative thromboprophylaxis in patients not known to be at high risk. Mclachlin J, Richards T, Paterson JC. An evaluation of clinical signs in the diagnosis of venous thrombosis. Arch Surg 1962; 85:738–744. Biuckians A, Meier GH. Treatment of symptomatic lower extremity acute deep venous thrombosis: role of mechanical thrombectomy. Vascular 2007; 15:297–303. Somjen GM. Anatomy of the superficial venous system. Dermatol Surg 1995; 21:35–45. Thomson H. The surgical anatomy of the superficial and perforating veins of the lower limb. Ann R Coll Surg Engl 1979; 61:198–205. Nawroth PP, Handley DA, Esmon CT, Stern DM. Interleukin 1 induces endothelial cell procoagulant while suppressing cell-surface anticoagulant activity. Proc Natl Acad Sci USA 1986; 83:3460–3464. Stewart GJ. Neutrophils and deep venous thrombosis. Haemostasis 1993; 23:127–140. Moneta GL, Nehler MR. The lower extremity venous system: anatomy and physiology of normal venous function and chronic venous insufficiency. In: Gloviczki P, Yao JST, editors. Handbook of venous disorders: guidelines of the American venous forum. 1st ed. London: Chapman and Hall Medical; 1996. 3–26. Joffe HV, Kucher N, Tapson VF, Goldhaber SZ. Upper-extremity deep vein thrombosis: a prospective registry of 592 patients. Circulation 2004; 110:1605–1611. Wakefield TW, Proctor MC. Current status of pulmonary embolism and venous thrombosis prophylaxis. Semin Vasc Surg 2000; 13:171–181. Acharya G, Singh K, Hansen JB, Kumar S, Maltau JM. Catheter-directed thrombolysis for the management of postpartum deep venous thrombosis. Acta Obstet Gynecol Scand 2005; 84:155–158. Carter CJ, Anderson FA, Wheeler HB. Epidemiology and pathophysiology of venous thromboembolism. In: Hull RD, Raskob GE, Pineo GF, editors. Venous thromboembolism: an evidence-based Atlas. Armonk, NY: Futura Publishing Company; 1996. 3–20. Caggiati A, Bergan JJ, Gloviczki P, Jantet G, Wendell-Smith CP, Partsch H. Nomenclature of the veins of the lower limbs: an international interdisciplinary consensus statement. J Vasc Surg 2002; 36:416–422. Zheng Y, Zhou B, Pu X. Frequency of protein C polymorphisms in Chinese population and thrombotic patients. Zhonghua Yi Xue Za Zhi 1998; 78:210–212. Johnson BF, Manzo RA, Bergelin RO, Strandness DE Jr. The site of residual abnormalities in the leg veins in long-term follow-up after deep vein thrombosis and their relationship to the development of the post-thrombotic syndrome. Int Angiol 1996; 15:14–19. Haenen JH, Wollersheim H, Janssen MC, Van’t Hof MA, Steijlen PM, van Langen H. Evolution of deep venous thrombosis: a 2-year follow-up using duplex ultrasound scan and strain-gauge plethysmography. J Vasc Surg 2001; 34:649–655. Heit JA, Mohr DN, Silverstein MD, Petterson TM, O’Fallon WM, Melton LJ 3rd. Predictors of recurrence after deep vein thrombosis and pulmonary embolism: a population-based cohort study. Arch Intern Med 2000; 160:761–768. Haeger K. Problems of acute deep venous thrombosis. Interpretation of Signs and Symptoms Angiology. Angioligy 1969; 20:219–223. Guhl JF. Arthroscopic treatment of osteochondritis dissecans. Clin Ortho 1982; 167:65–74. Highgenboten DC. Arthroscopic synovectomy. Arthroscopy 1985; 1:190–193. Li W, Salanitri J, Tutton S, Dunkle EE, Schneider JR, Caprini JA. Lower extremity deep venous thrombosis: evaluation with ferumoxytol-enhanced MR imaging and dual-contrast mechanism − preliminary experience. Radiology 2007; 242:873–881. Kakkos SK, Caprini JA, Geroulakos G, Nicolaides AN, Stansby GP, Reddy DJ. Combined intermittent pneumatic leg compression and pharmacological prophylaxis for prevention of venous thromboembolism in high-risk patients. Cochrane Database Syst Rev 2008; 8:CD005258.